Browse: Home / Multiscanner – Analyse files against multiple engines. 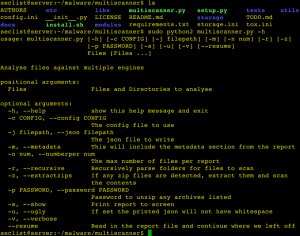 MultiScanner is a file analysis framework that assists the user in evaluating a set of files by automatically running a suite of tools for the user and aggregating the output. Tools can be custom built python scripts, web APIs, software running on another machine, etc. Tools are incorporated by creating modules that run in the MultiScanner framework. Python 2.7 is recommended. Compatibility with 2.7+ and 3.3+ is supported but not thoroughly maintained and tested. Please submit an issue or a pull request fixing any issues found with other versions of Python. ← blindy – Simple script to automate bruteforcing blind sql injection vulnerabilities.